The collection includes two radio transcripts, inscribed publications, a letter to Robert F. Kennedy, a letter from President Johnson, and ephemera. Of particular interest are the two transcripts, which archivists thought complemented a memorial broadcast, “John F. Kennedy – A Personal Memory”, written by Robert Greene for the Voice of America in April 1964. (The Library holds this sound recording in the United States Information Agency Audio Recordings collection and we were excited to have the transcript to go along with it.) 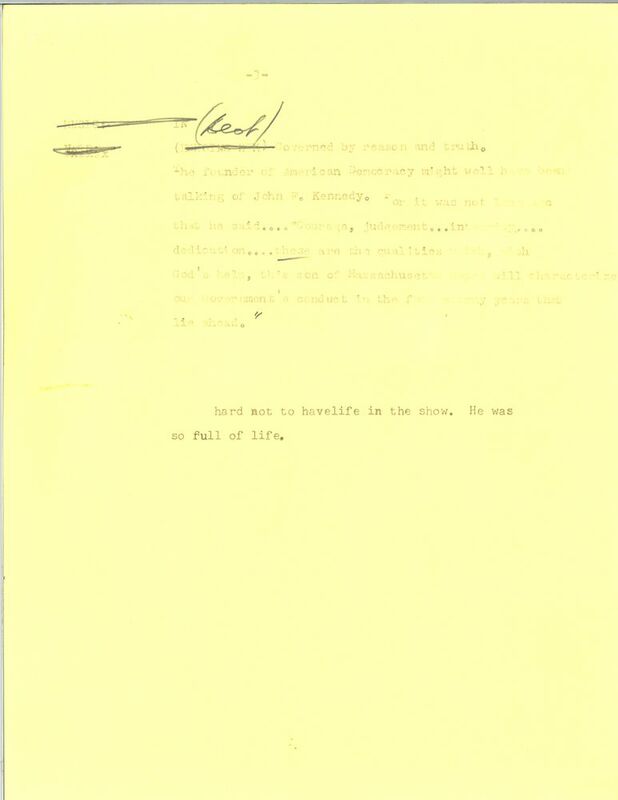 Upon closer inspection, it was determined that these transcripts, titled “Memorial to John F. Kennedy”, were drafts for a VOA broadcast following President John F. Kennedy’s assassination. According to the handwritten dates on the documents, Greene began drafting the script on the very day of Kennedy’s death. In the drafts, we can see Greene trying to create something that would address his emotions alongside those of his audience. Though Greene had close to two decades of experience writing for radio and television, the degree to which he labored over word choice and rhythm is evident in handwritten edits on the transcript. In the second draft, the more romantic language about JFK’s physical features has been struck out. 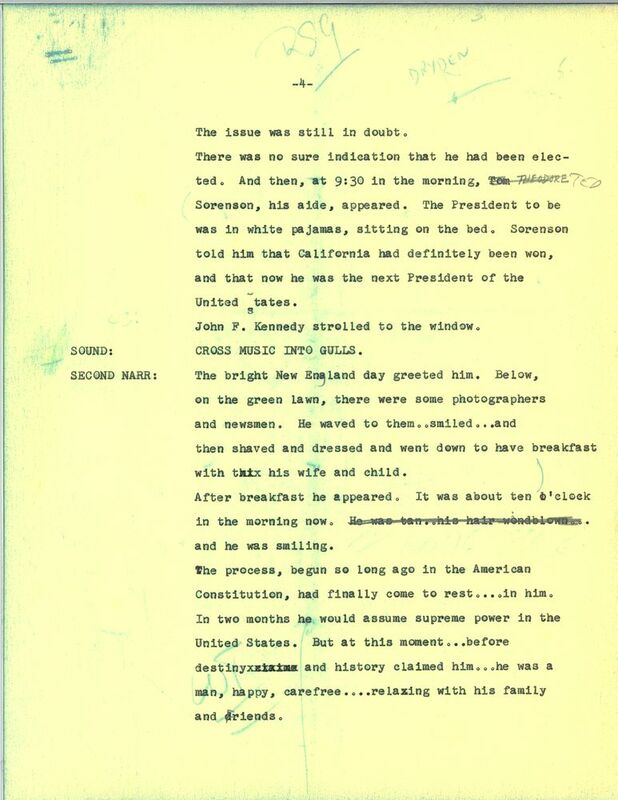 Beyond what we learn from the content of the broadcast transcript, these original drafts allow us to see more clearly from the author’s perspective: they show us how the pages are cut and pasted together, when a line break was inserted to indicate a pause, or which words are added and taken away. Unfortunately, we do not know if this piece ever aired. However, it is illuminating to see Greene’s process in writing for a moment without precedent in his career and for both a national and international audience. A detailed guide to the Robert S. Greene Personal Papers is available on our website.